AirCasting is an open-source, end-to-end solution for collecting, displaying, and sharing health and environmental data using your smartphone. The platform consists of sensors that detect changes in your environment and physiology, including a palm-sized air quality monitor called the AirBeam, the AirCasting Android app, the AirCasting website, and wearable LED accessories. By documenting and leveraging health and environmental data to inform personal decision-making and public policy, the AirCasting platform empowers citizen scientists and changemakers. 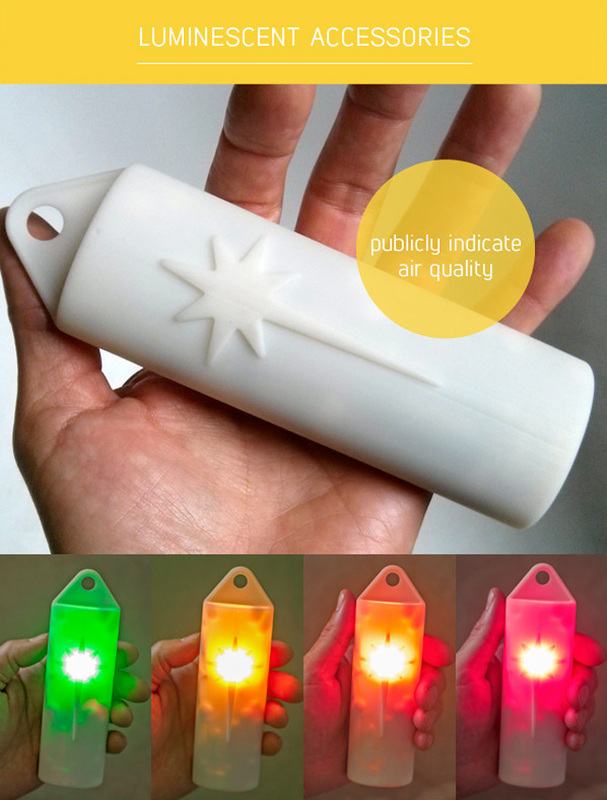 The AirBeam uses a light scattering method to measure fine particulate matter or PM2.5. Air is drawn through a sensing chamber wherein light from a laser scatters off particles in the airstream. This light scatter is registered by a detector and converted into a measurement that estimates the number of particles in the air. Why is this important? The US Environmental Protection Agency monitors and regulates six criteria air pollutants, one of which is PM2.5, and the EPA’s measurements indicate that PM2.5 levels pose a substantial health risk in cities across the country. 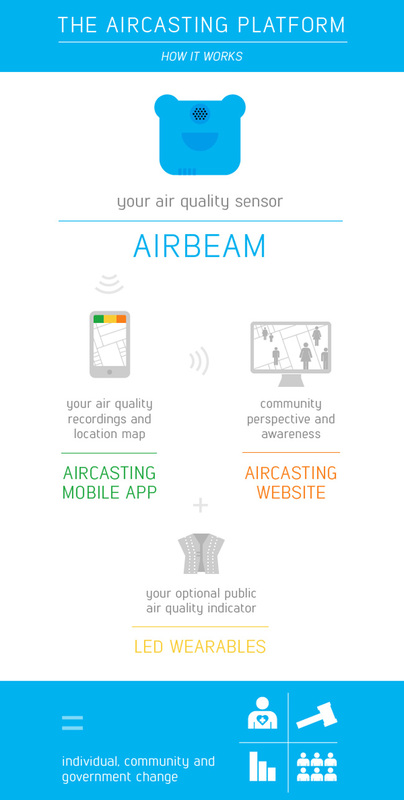 When recording a mobile AirBeam session, your measurements are communicated approximately once a second to the AirCasting Android app via Bluetooth. When recording a fixed AirBeam session, these measurements are communicated approximately once a minute to the AirCasting website via WiFi or cellular. 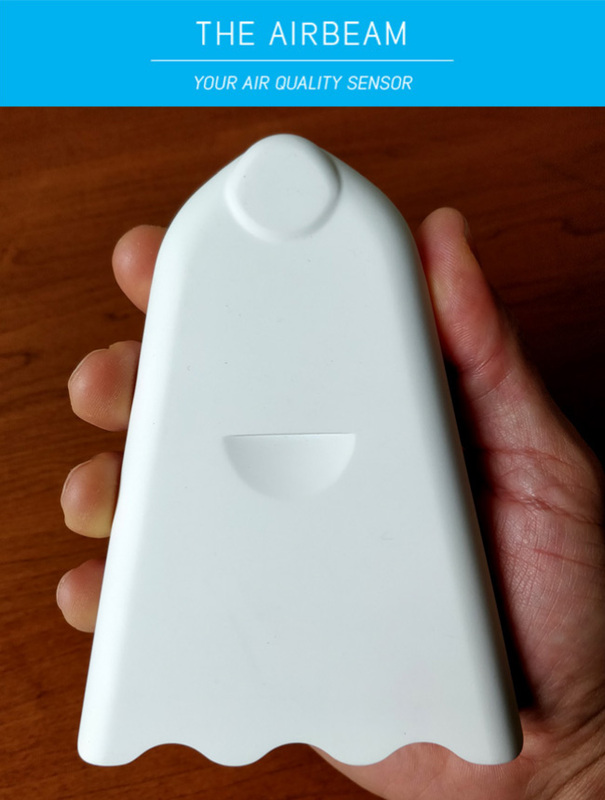 At the end of each mobile AirCasting session, the collected data is sent to the AirCasting website, where the data is crowdsourced with data from other AirCasters to generate heat maps indicating where particulate matter concentrations are highest and lowest. AirCasting Luminescent Accessories connect to the AirCasting app over Bluetooth to illuminate LEDs in response to the sensor measurements received by the AirCasting app: green for low intensity, then yellow, then orange, and red for high intensity. To date we’ve released designs for two Luminescent Accessories: the AirCasting Luminescent Vest and the LiteBeam. AirCasting Luminescence was developed to communicate sensor measurements without the normally required reference to a screen interface and to spark interaction between AirCasters and people located in their immediate vicinity. Download the AirCasting Arduino sketch for the AirCasting Air monitor, which controls the sensors and sends data to the app via Bluetooth.